5.75 points at 16 votes (rank 680). In the magic country "Nevermore" ruled four magicians, which wrote down their knowledge in secret scripts until one day the warlock Colo made it to steal them and kill the white magicians. Now fear and horror reigned the country. But there was still some hope. A good witch, who had been apprentice to the magicians, knew of the magic scripts and how the mighty Colo could be defeated. Armed with a magic wand and a bow the brave witch set out for the dangerous way to Colosbau. In this shoot'em up, you can make your war through four different plains and change your way as you walk on. To reach all four scripts you must have reached the end of every plain at least once. 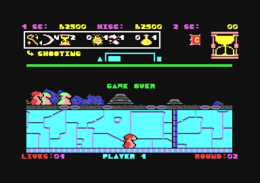 The game area, which is divided into four planes with different graphics and between which you can change at any time, is shown in 2D and scrolls horizontally into both directions. The unspectacular, but yet pleasing background music accompanies the player through the whole game. Your character is controlled by joystick. The chest contains different items. Either bonus points, a balloon with which you can ascend to the next higher plane, or useful "magic weapons". Colosbau consists of four planes: sky, forest, cave and ice. Between these landscapes you can jump and fall. To succeed in the different levels it is important to ration your magic weapons well and if possible to use them only in the higher levels. On the way to the secret scripts you are expected by different goblins, colos guards, skeletto and dangerous birds. A lief genie, which is placed in the upper planes tries to catch you and get you two planes lower. At the end of each plane there is a script hidden. 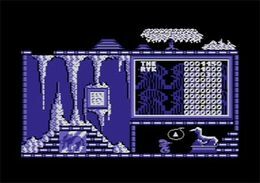 If you have all four scripts you fight against the warlock Colo.
TheRyk: "I had it in one of my games collections in 1987, which I received by the Santa additionally to the C64, this was probably Future Games 64 (Collection) or Power Pack 10 (Collection). Measured by this I hadn't expected much. My expectations were neither exceeded nor disappointed. Technically there is not much to complain about but also not much to commend. A consistently moderate Run&Jump game. The sound of the magic apprentice just gets on your nerves after a while, although when considered objectively there is nothing to criticise about the sound and graphics. The game didn't suit my taste. The level of difficulty is frustratingly high right from the start. Moderate 4 points out of 10. In comparison to the other titles in the games collection as Fist II - The Legend Continues, Uchi Mata, Madness (without Magic) this game looks rather poor." H.T.W: "The game isn't half bad. If you have taken in, what magic weapons you can use against which enemies and which enemies are immune, it is even quite fun. Also the changing between the planes brings some strategy into the game. Furthermore, the highscore list is designed lovingly (what a pity that it cannot be saved)." The game is included in the collection Power Pack and the Future-Games 64 collection.